While not near as ambitious as previous excursions of BiaD, yesterdays little foray was just as important to the layout owner as my larger jobs. Yesterday I was in Sarnia helping out my friend, Don Janes, with a little project. As his layout has evolved he's wanted to extend his mainline running options and create some hidden staging. 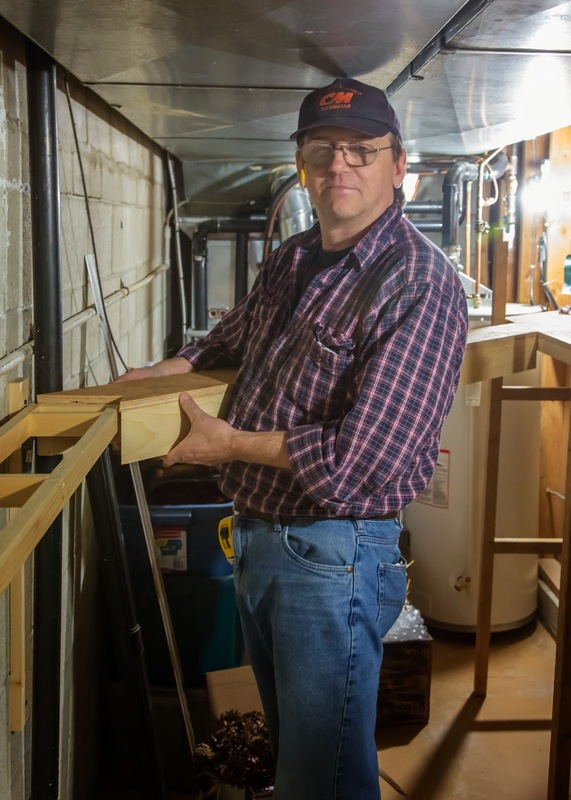 The first step was for Don to clean out the utility room and repurpose a shelving unit into a staging yard. As seen on the right in the first image. From there, I took the reins. First was to create the mounting arrangement for the 6' by 10'0" long shelf on the left. So I just strapped the wall with 2' lengths of 1 x 3 to accept steel shelf brackets. Simple, no? It would have been simple had the hammer drill not failed on the 2nd hole. I wound up having to drill the remainder of the holes for the Tapcon concrete anchors with a conventional drill. Makes the job 4 times as long and thoroughly unpleasant. But we prevailed. With that done and a simple frame built for the maniline, a "bridge" was required to span across the open space. 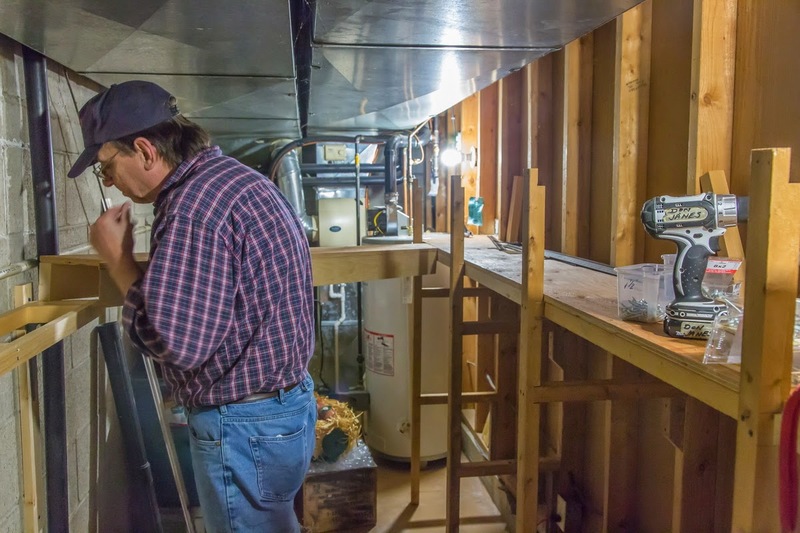 It was important to Don that access to the furnace and water heater be maintained. Should either unit fail it will be a simple matter of pulling a couple of screws and lifting the "bridge" out. We simply cut a 6" wide piece of 5/8" ply, laid it across the spanned area, cut the ends to right angles and then stiffened the plank with a piece of 1 x 4 on either side. It rests on simple cleats. Don's happy. He can now lay track to his heart's content. After some time spent on layout scenery today, the treeline and work on an orchard which I'll share when it's done, it was time to clean part of the layout. The tricky part. The 2 staging yards. It's sort of a mixed blessing task. I hate cleaning. But I hate dusty roofs and balky operations due to dirty track more. So I can accomplish a couple of things at once. Bonus round! 1- Move the train on the track out onto the layout. 2- While the train rolls by, dust the car tops with a shaving brush. 3- Use the bright boy block to wipe over the rails. 5- Rub a graphite stick over the rails. 6- Return train to it's staging track. That's 6 tracks in 2 staging yards. The graphite puts a film of conductive protection over the rails. It's a trick I learnt from Trevor Marshall and he gave them the stick of artist's graphite. In a week or so, I'll have to clean the rest of the layout. OPs session coming up, but scenery is underway near Renton, so I'll leave it to the last minute. To steal one of Trevor's favorite phrases. That was a large part of today's efforts. The bonus, I found a box of trees from the old layout that I'd kinda forgotten about. They're not "Supertrees", but they're large Woodland Scenics trees done for me by my friend Brian Dickey. They lack the open, lacy appearance of a Supertree, and that works for me in this location. The tree line will act as a view block to trains coming and going from the eastern end staging yard. I do want to get the air brush out and break up the monotone aspects of the foliage. Wonder what I'll find in the next box I open? It all started during the last ops session we had here. (no I'm not blaming my crews.) The comment was made that since we're keeping the actual speeds of the trains slow, the digital sounds should be tweaked to at least make the units sound like they are working. A request that actually made a lot of sense to me. Some conversations and consulting left me with the conclusion that the simplest solution would be to amend to speed curves and/or the Max Volt the motors would see. Things that can be very finely controlled with DCC decoders. Now the problem comes in that all of the F7s have factory installed QSI decoders and the SW-8s have QSI decoders that I've installed. QSI uses a unique "extended addresses" for amending CVs. Not easily done without a Quantum programmer. Now I didn't need the programmer for the basic programming tweaks I wanted to do, but I certainly did for the some of the finer refinements I wanted to make. So I went shopping. Much to my surprise, a Quantum Programmer wasn't that easy to find, at the time I was shopping around. But I did find one. You get this little pc peripheral device, a USB cord, a software disc and a wall transformer for power. I installed the software as directed, plugged in the device and that's where the trouble started. Turns out I had purchased an older unit, the USB drivers didn't much like Windows 7. I called QSI for some customer support. took 2 weeks of constant calling to finally speak to a human being. Josh, the owner, tried very hard to talk me through the various upgrade downloads required. But we kept running into the same problem. The SiLabs USB Driver software would not upgrade from 3.1 to 3.2. Josh told me that he'd have to talk to his software guru and he'd get back to me. 2 weeks go by and I had not yet heard from Josh. I called him. Took another 3 days of persistence but I got him. He coached me through a "fix". Josh, very frustrated, told me he'd get back to me in a couple of days. I've yet to hear from back from him. After waiting a few more weeks, I took the bull by the horns. I called my "Nerds on Site" guy, who has performed major pc surgery for me over the years and has an interest in model trains as well. He came over and looked at the problem. Had it fixed in 5 minutes. Turns out that he had to manually point the software upgrade to the right place to go. So now I'm reprogramming DCC sound decoders after almost 3 months of frustration. I have to say that the QSI documentation is like reading old DOS manuals. Very poorly done. But fortunately the sound quality makes up for the shortcomings in the paperwork. I've now tweaked half of my F7 fleet. They sound delightful. At typical layout speeds they growl away just like you'd expect when pulling a Red Ball freight down the main. Now I want to explore the auto brake squeal option, but I suspect newer chipsets might be in order. I will tell this, if it wasn;t for the fact that I had 23 QSI decoders already in place, I would have happily replaced them all with Tsumani decoders. The customer support from QSI was poor to say the least. 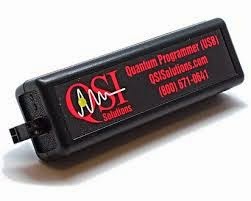 But I do want to thank, Nick Kulp and Bob Menzies, 2 gentlemen from the QSI Yahoo Group who contacted me directly and helped me through some steep learning curve aspects of dealing with QSI products. Too bad they don't answer the phones for QSI. This project was actually fun. A client sent me 3 factory painted O scale brass PRR hoppers to be weathered. He included rather specific requests for the different looks he wanted for the 3 cars, along with some very useful colour imagery. These are just 2 of the images provided. The challenge for me was to replicate the various looks with the mediums I had at hand. I started by giving all 3 cars an India Ink wash. From there each car was sprayed with different tones of dirty rust colours, varying each car. Once that dried, out came the artist oils for 2 of the cars. I blotched the sides in a random fashion varying the colour and dirt patterns between the cars and then pulled it together with some more overspray. The third car wanted that blue/gray steel look from washed away paint. This was the look that I struggled with the most in my mind. It's easy to apply paint, real hard to remove. I made a mask from cardstock and held it off the car side about 1/4" and sprayed a blue/gray mix through it. The mask softened the edge and the thinness of the paint captured the look. The car I worried the most about turned out to be the easiest to do. I'm rather pleased with my efforts and I've no doubt the client will be as well. That's cause I've been sending him progress images as this job went along. I'm always careful with "heavy" weathering. So easy to go too far. 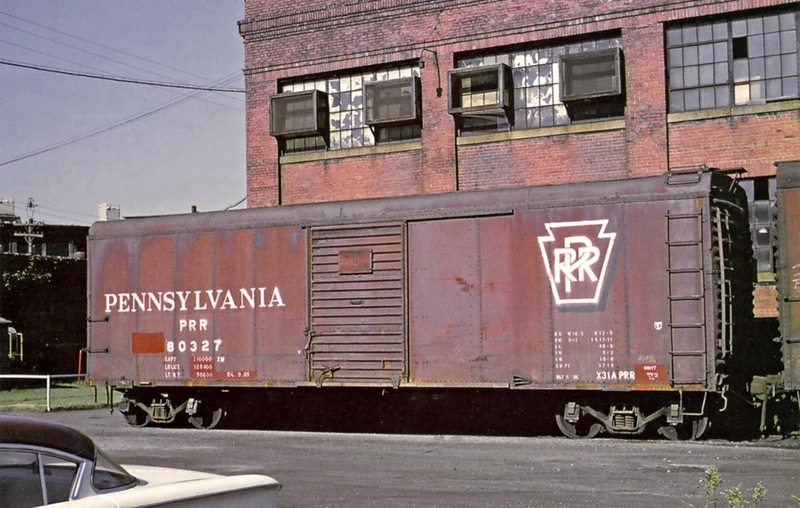 There's a debate on Yahoo STMFC right now concerning the color of the roofs on Swift reefers. The instructions in the old Sunshine kits is a confusing when you compare notes between the wood sheathed cars and the steel sided cars. I had the late Richard Hendrickson come to my rescue with a great colour photo. Great photo. Wish I could remember what year it was taken. This just in, the location is Sioux City, IA. I should have indicated that the discussion is whether the Swift reefers had Mineral Red or black roofs. The discussion is aggravated by the colour shifts that can happen in the printing process. This photo is also published in a book where the roofs look far blacker than in the image I show here.